Reliance Nippon Life Asset Management Limited has launched its third issue of CPSE ETF. Called CPSE ETF Further Fund Offer (FFO) 3, the issue opened yesterday for the Anchor investors and will open today for the Non-Anchor investors, including the retail investors. The government targets to raise between Rs. 12,000 to Rs. 14,000 crore from this issue by selling its stake in the eleven constituents of the CPSE ETF. 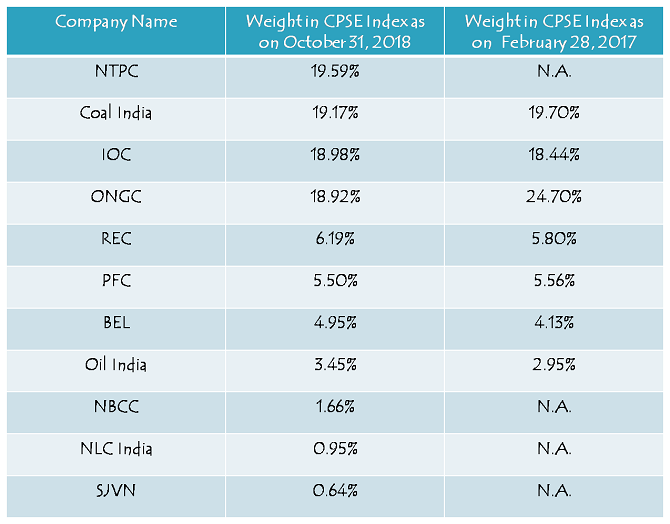 Nifty CPSE Index – It is one of the indices of the National Stock Exchange (NSE) carrying 11 public sector undertakings (PSUs) in which the central government has more than 53% stake and these companies have more than Rs. 1,000 crore in market capitalisation. All these companies are profitable and are either Maharatnas, Navratnas or Mini Ratnas. High Dividend Yield & Reasonable Valuations – All the constituents of CPSE ETF are profitable and have paid around 5.25% dividend to their investors on an average. As per the data compiled by equity analysts, high dividend yield stocks carry lower volatility in returns as compared to growth stocks. So, one can expect a relatively stable performance from these stocks. Moreover, CPSE ETF has a P/E ratio of 9.37 times and P/B ratio of 1.42 times, which as compared to some of the other indices is quite attractive. 4.5% Discount for Investors – As against 3.5% discount the government had offered to the investors in its issue in March 2017, the discount has been increased to 4.5% to the investors of CPSE ETF this time around, probably because the issue size is 4 times bigger than the previous one. This 4.5% discount will be calculated on the “FFO 2 Reference Market Price” of the underlying shares of the Nifty CPSE Index and will be passed on to the CPSE ETF by the government of India. Reference Market Price/NAV – CPSE ETF is currently trading at Rs. 24.24 on the stock exchanges. This is also its reference market price or NAV. As the investors get allotment and FFO units get listed on the stock exchanges, market price of each unit of this ETF will be linked to the Nifty CPSE Index and its returns would be quite close to the returns generated by the CPSE Index. Investment Objective – The scheme intends to generate returns that closely correspond to the total returns generated by the Nifty CPSE Index, by investing in the securities which are constituents of the Nifty CPSE Index in the same proportion as in the index. However, the performance of the scheme may differ from that of the Nifty CPSE Index due to tracking error, scheme expenses and the initial discount of 4.5%. Target Amount to be Raised – The government has fixed the base issue size to be Rs. 8,000 crore during this 4-day offer period. In case of oversubscription, the government plans to retain oversubscription to the extent of Rs. 4,000 crore to Rs. 6,000 crore. However, the government is yet to decide the final amount it would like to retain post the issue closure. Minimum/Maximum Investment Size – Individual investors can invest in the scheme with a minimum investment amount of Rs. 5,000 and there is no upper limit on the investment amount. However, retail investors investing upto Rs. 2 lakhs will be given preference in allotment in case there is an oversubscription. Allotment & Listing – As per the offer document, units of this ETF will get allotted and listed on the NSE and BSE within 5 business days from the closing date of the issue. Demat Account Mandatory – Investors need to have a demat account to apply for this FFO. Applications without relevant demat account details are liable to get rejected. Entry & Exit Load – This scheme is not subject to any entry load or any exit load. Anchor Investors – Maximum 30% of Rs. 8,000 crore i.e. Rs. 2,400 crore will be allocated to the anchor investors. Retail Individual Investors – After the anchor book closure on November 27, retail individual investors are allowed to take up all of the remaining portion of this FFO i.e. Rs. 5,600 crore. Qualified Institutional Buyers (QIBs) & Non-Institutional Investors (NIIs) – QIBs and NIIs will have nothing reserved for them in this FFO. They will be allotted units only if the subscription numbers of the retail investors and/or anchor investors fall short of their reserved quotas. Thanks Sir for details. If possible kindly send link to check subscription status,? Unfortunately, there is no link to check subscription numbers of this offering. any dividend payment by Reliance. This ETF doesn’t pay any dividend. However, its constituents pay dividend and that dividend gets reinvested to buy more shares of the dividend paying company. If dividends were paid by CPSE FFO1 & FFO2, kindly suggest how to find date on which paid & % of investment? Sir, why is that your write-ups are incomplete nowadays? You fail to provide TIMELY advice & your analytical comments like you used to provide earlier. Your revised method of an incomplete article is somewhat baffling to your old and loyal followers like myself. May I request you, on behalf of your band of followers, to provide your esteemed advise and also revert to the comprehensive write-ups of old. Thank you, Sir. Yes,i too agree. We have to keep checking whether it is updated or not and recently some have not been updated. The information is there but whether to invest or not has not been added. If we could read it all together that would be great ! Sure, I’ll try to do the same from the next post onwards. Also Sir, I am still unable find out if any dividend was ever paid by CPSE ETF? Any news about NHAI issue i.e. when is it being opened for subscription? There is no update yet from NHAI on its upcoming bonds sale. But where is the advise whether to invest or not. What is the unit allotment date of Reliance CPSE ETF FFO 3 whose subscription was closed on 29.11.2018. How do I know my application status as I applied for Rs. 100000/= as retail investor ! This is nice post for reliance cpse etf and having right articles to see you here and thanks a lot for sharing with us.